The Rex is a rechargeable keychain light by LRI : the creators of the Photon Freedom. 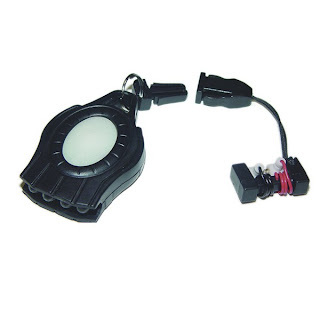 The Rex features four bright white leds and the interface is very similar to the one in the photon freedom. The brightness can be regulated keeping the button pressed, when maximum it is about as twice as bright as the popular photon freedom. After the brightness settings there are four additional modes in the interface: a fast strobe, medium strobe, slow strobe and SOS mode. The single button operation is easy and the button glows in the dark after being charged by direct sunlight or fluorescent light. What makes the Rex so interesting is that it is rechargeable keychain light, to recharge it you have to insert the recharging kit into the Rex and then just plug the mini magnets at the other end to any 1.5v battery you have around. AA, AAA, C and D batteries work well, if you use rechargeable batteries then you have a complete rechargeable kit. Having an extra AA or even AAA battery around allows you to recharge the Rex anytime you need and anywhere you want. This curious recharging interface is like a hack but works well and it is very practical to be able to recharge the light using common batteries you can get anywhere. The Rex is a lot bigger than a photon freedom, being about twice as big so if the freedom was fine for your keychain the Rex might be slightly bulkier. A very interesting option for a rechargeable keychain light. You can get it for $24 at LightHound.